Thedon78@mail.com Ransomware is not just any kind of threat. This infection is truly dangerous because it can cause some serious damage. When it infiltrates your operating system, it can encrypt your files, and decrypting them might be very difficult or even impossible. According to our malware researchers, it is possible that a file decryption tool capable of decoding the encryption algorithm might exist, and you should definitely look into that. The last thing you should do is pay the ransom that the creator of the malicious ransomware wants you to pay. Though you are not introduced to the ransom right away, the TXT file represented by this malware pushes you to initiate communication, and, if you do that, cyber criminals will for sure demand a ransom. Hopefully, you find a working decryptor because paying the ransom might not only be unnecessary but also very wasteful. To learn more about this, as well as the removal of Thedon78@mail.com Ransomware, please continue reading. According to the research we have conducted, the malicious Thedon78@mail.com Ransomware is very similar to Centrumfr@india.com Ransomware, which is a threat we have reported in the past. Even the ransom notes represented via their TXT files are almost identical, and this is what leads us to believe that maybe these threats were created by the same party. Some malware experts also recognize this malware by the name “FenixLocker,” so be aware of that. The name we use for the infection derives from the email address – thedon78@mail.com – that is represented via the “Help to decrypt.txt” file. This is the TXT file that we mentioned already. The message within the file is very short, and it simply informs that you need to email the provided address if you want to have your files decrypted. This might be how you find out that your files were encrypted because the encryption process is silent. Of course, you can also figure out that your files were corrupted when you find that you cannot open them and that the “.thedon78@mail.com” extension is attached to them. 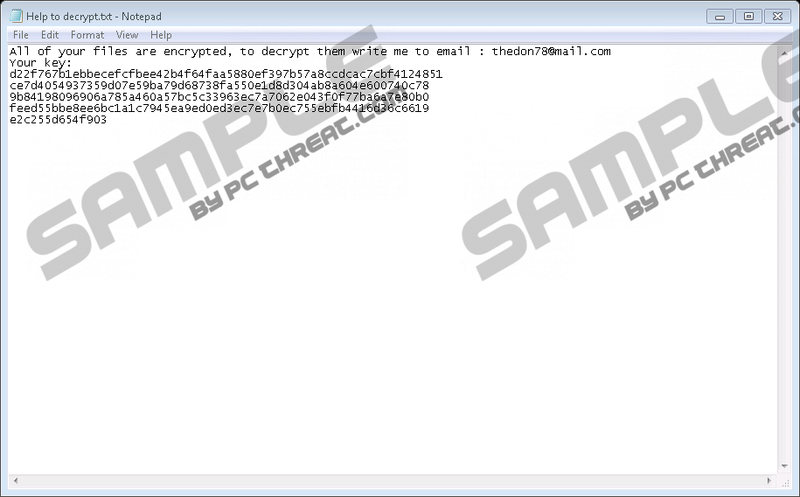 It was recently discovered that Thedon78@mail.com Ransomware can encrypt various files, not just your personal files. Although it is unlikely to encrypt executable files – which would make all apps crash immediately – it can encrypt the components (e.g., language files) of existing applications to render them useless. Surely, you can replace system and software files, but your personal files might be harder to salvage. As mentioned previously, you might find a file decryptor, or you might be able to replace the corrupted files with the backup copies. If you have not backed up your files and if you are unable to find a decryptor that works, you might start thinking about the ransom payment. Think again if that is really what you want to do. Remember that Thedon78@mail.com Ransomware was created by cyber crooks, and it is impossible to predict how they will act once they receive the payment that is demanded from you. They could provide you with the decryptor, but they could also take your money and disappear. Note that even if your files get decrypted, the ransomware must be deleted immediately. Now that you know exactly what kind of a threat Thedon78@mail.com Ransomware is, do you think you can remove it from your operating system successfully? If you are not so sure, it is best for you to employ an anti-malware tool that will automatically delete Thedon78@mail.com Ransomware from your PC along with other infections. We do not claim that other infections are active, but it is always possible as long as your operating system is open to malware. Even better, anti-malware software will ensure that your system’s protection is strengthened so that it stays malware-free in the future. Of course, you cannot forget about this even if you successfully eliminate the ransomware manually. The guide below was created to help you erase this threat, and, as you can see, it is very easy to follow. The main task is to find and delete the malicious .exe file, which you might have acquired via a corrupted spam email. If you cannot find this file, instead of giving up, employ an anti-malware tool. Discover the malicious .exe file and Delete it. Delete the Help to decrypt.txt file (note that it is copied to every folder with encrypted files). Install a malware scanner to inspect your PC for leftovers. Replace the corrupted files that are replaceable and eliminate the ones that were corrupted. Quick & tested solution for Thedon78@mail.com Ransomware removal.